Designer Ryan Johnson has been honing his tactical tomahawk designs over the last 30 years and has earned a dedicated and loyal fan base, particularly among special forces troops. His Chogan and Kangee T-Hawks are shaped of single-piece steel with a curved handle and grip choils along the front for enhanced holding power. Full-length handle scales are checkered for added grip security, and can be removed for cleaning. The two different models offer distinctive bladed head styles, which both provide exceptional utility and toughness. Molle equipped, form-fitting Kydex sheaths slip over the head and secure with a buckled strap. 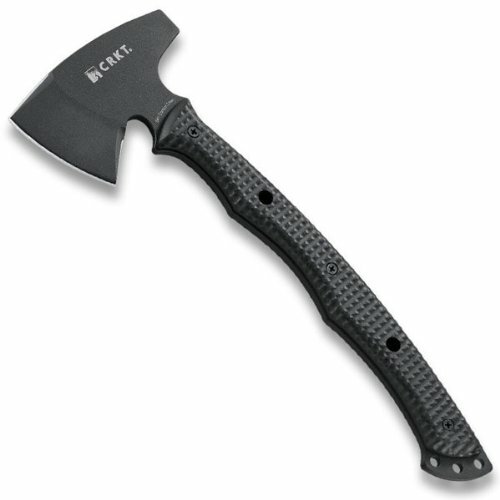 Available in both the Chogan and Kangee T-Hawk (tactical tomahawk) models. You will find both of these T-Hawks very well balanced and easily controlled, while still being robust enough to handle most anything dished out. Blade Length: 2.93 inch; Overall Length: 14 inch; Weight: 1 lb. 8.6 oz.